?The belly is an ungrateful wretch, it never remembers past favors, it always wants more tomorrow.? Aleksandr Solzhenitsyn wrote in his book One Day in the Life of Ivan Denisovich. And Indiantelevision.com?s Exec Lifestyle section knows just how to whet that ungrateful wretch?s appetite! In my short career as a lifestyle journalist, I have come across a handful of dining places, which have made my taste buds do cartwheels of delight. Catering to the gastronomic cravings of those who have made it their lives? missions to indulge in fine dining, in this section I bring to you five top notch restaurants and cafeterias across India, which will tickle your taste buds and leave you yearning for more. These eclectic eating destinations cater to diverse palate cravings and are unique in their concept and ambience. These restaurants have also achieved at least a 4.2/5 rating on Zomato and 4/5 rating on Tripadvisor. So indulge in my Top 5 eating out places for the weekend and I assure you that there?s something for everyone in this listing! 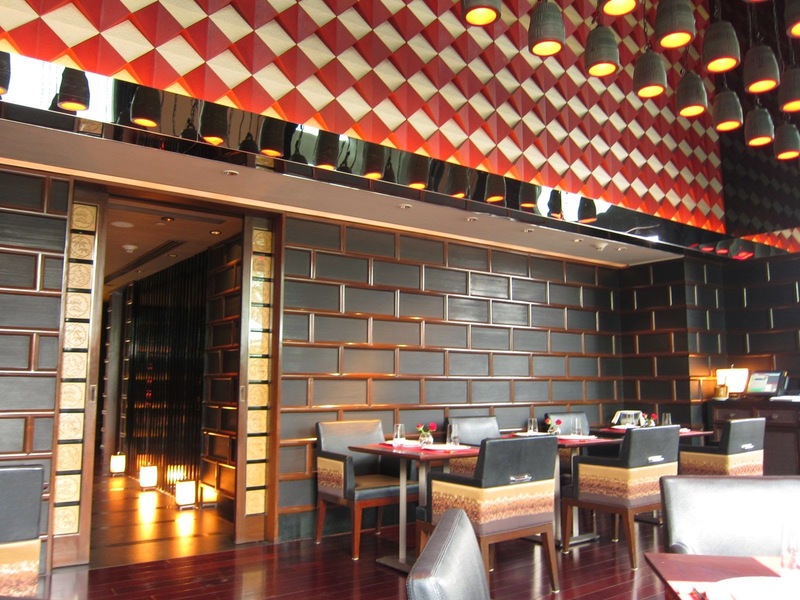 Situated in the heart of Mumbai?s fashionable Bandra district, Hakkasan is a Michelin star Chinese restaurant that opened three years ago in India. If you want your daily dose of glitz and glamour, this is the place for some celeb-spotting. From Saifeena, Deepika Padukone, Katrina Kaif to Karan Johar, a galaxy of stars can regularly be seen shining and dining here! The glamorous interiors of the restaurant have been designed by the renowned Gilles & Boissier. The restaurant, which can accommodate up to 120 guests, has an elegant ambiance with dark-stained English oak screens and a backlit blue glass that fully surrounds the restaurant. ?The experience speaks for itself,? said a spokesperson from Hakkasan. In 2015, Hakkasan will be launching Dimsum Weekends, which will comprise special set menus for every weekend starting January. February will see an exciting lineup of Chinese New Year special food. Hakkasan signature offerings include Edamame Dumplings, Stir-Fried Lotus Root with Asparagus and Yam Bean, Baked Chilean Sea Bass and Pi Pa Duck. On their first visit to India, Masterchefs from Australia, Gary Mehigan and George Calombaris gorged on Sushi for lunch at The Megu. This Japanese restaurant is housed at The Leela Palace in New Delhi and its unique concept is well-defined by its sophisticated interiors, which offers an amazing dining experience for all. The Megu specialises in hand-made tofu, exquisite sushi and sumibi aburiyaki - a grilling technique using Kyoto charcoal known as bincho-tan. Vivek Oberoi, Sonam Kapoor and Katrina Kaif can often be spotted at this fine dining hub. Talking about what sets this Japanese restaurant apart, a spokesperson from The Megu told us, ?Our chef, Yutaka Saito works with you way in advance to tailor-make menus as you entertain your business associates, close friends or family.? In February 2015, the restaurant will dish out a fresh menu for its patrons, showcasing unique presentations of tantalizing summer flavours with authentic Japanese ingredients at the core. Signature dishes include Yellowtail Carpaccio, Megu Oriental Salad, Salmon Tartare, Spicy Baked Unagi, Shira Ae, Pan Seared Sea Bass, Silver Cod, Spicy Ebi Cracker Roll, Megu Original Crispy Asparagus, Grilled King Crab and Vegetable Rainbow Roll. Oh! Calcutta stands amongst India?s biggest culinary hits and is one of the few eating destinations that can now be found across major Indian cities. ?Great ambience, new food innovations and warm hospitality have always been our plus points,? said a spokesperson from the restaurant, which is situated at Elgin Road in the City of Joy. With a touch of European d?cor, photographs of famous personalities and landmarks of Kolkata framed on the walls of the restaurant, Oh! Calcutta is definitely an ode to Bengali food and celebrates the city of Kolkata. Cricketing legends likes Sachin Tendulkar and Sourav Ganguly love eating here, as does the Bollywood legend Mithun Chakraborty. Currently, there is an Anglo-Indian festival being held at the restaurant and it is recommended that you book a table at least a day in advance and reserve your seat. Oh! Calcutta offers legendary Bengali recipes and its mouthwatering menu includes Cholar Daal, Fish Fry, Kasha Mangso, Bhapa Hilsa, Smoked Bhetki and Mutton Rezzala. There is a good mix of traditional Bengali, Nawabi and colonial cuisines. A must visit for starry-eyed couples in love, the very romantic Le Pain Quotidien is situated a stone?s throw away from the Gateway of India. ?There?s simple food with a different ambience, which dins the noise from the ruckus outside,? said a spokesperson when describing the Belgian caf? chain, which has eye-catching artwork comprising wooden tables and chairs. The communal tables at Le Pain Quotidien allow friends and strangers to come together and interact over freshly baked breads and croissants. Le Pain Quotidien is highly popular for its Sunday Brunch. In 2015, the restaurant plans to put together a special menu comprising six to seven dishes, every three months. The menu will also consist of the Baker?s Basket that includes an assortment of organic bread, served with jam and eggless spreads. Signature dishes include Five Spiced Chicken Skewers, Forest Mushroom Tartine with Gruyere Cheese, Potato R?sti, Pan Seared Basa and the special seasonal Mango Mousse slice along with a variety of pastries, soups, salads, beers and wines. An exclusive menu catered for all vegans and a Valentine?s Day special meal is also in the pipeline for the first quarter. The caf? caters to a range of people from business professionals, families, tourists and celebrities. Its eminent guests include Hrithik Roshan, Arjun Rampal, Jacqueline Fernandez, Juhi Chawla, Rishi Kapoor and Sidhartha Mallya amongst others. Largely considered as one of Chennai?s best fine dining buffet restaurant, Madras Pavilion serves a wide range of dishes that stem from both Western and Eastern roots. These include modern antipasti, signature world cuisines, flavours from South India and authentic Indian delicacies. Along with a first-class dining experience in a refined setting, this fine dining restaurant has a set of diverse table arrangements with thematic zones like Love Seats, The Crown, The High Table and The Private Zone. ?The concept of a buffet walking to the table is something to look forward to in 2015. It is a service design where in on a rotational basis, each section of the main kitchen dishes out grazing portions of culinary delights, served individually to the seated guest,? said a spokesperson from the restaurant that is located at the palatial ITC Grand Chola in Chennai. In 2015, the restaurant is also poised to add to its menu an impeccable spread of Indian and international selections. The options range from Chettinad cuisine, Poached Eggs and Bacon, Chicken Dum Biriyani, Dim Sum and even north Indian cuisine. Madras Pavilion?s specialty, Big Sunday Brunch includes chef?s signature BBQ Grills, Hand Rolled Thin Crust Pizza, International Carvery, Antipasti & Gourmet Cheese Board, international desserts, waffles, oven fresh breads, baked alaska and more. Apart from that, some of the most loved dishes at Madras Pavilion include Beatle Leaf Wrapped Chicken with Tamarind Jus, Lotus Chip and Lemon Meen da Gassi (Fish cubes simmered in aromatic gravy of coconut and spices), Kodi Biriyani( Biryani from Ambur region of Tamil nadu , made with special Jeera Samba rice), Gosht Bohri Biryani (Lamb Biryani from the Bohri community), Moist Chocolate cake and Decedent Mud Crumble.